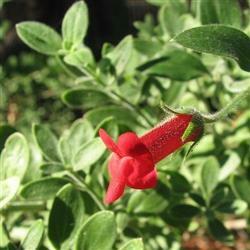 This perennial has red 1" long snapdragon-like flowers that really pop every spring. Island Bush Snapdragon will flower year round, but with the heaviest bloom in winter and spring. Branches tend to be long and arching and will climb up and intertwine with other plants. Plant in a border with other native perennials, over walls, down banks or use as a large-scale groundcover. This versatile plant will also tolerate the dry shade under oak trees. It is drought tolerant but for the best flower show a little extra water is needed. The first two plants did so well on a slope with partial shade, that I purchased two more. They are beautiful, with bright green leaves and scarlet flowers, cascading down the slope. Highly recommended!